I fondly breathe thy much-loved name. I’ll forever be thy Valentine. Julia Bissonnette had no need to look at the creased billet-doux clutched in her hand; she knew the words by heart. Still, she couldn’t bring herself to tuck the scrap of paper away in her reticule. She cherished it as much as the small velvet case, shiny from much devoted handling, that contained Charles’ portrait and a lock of his russet hair. She had spent nearly a week traveling from New York to the Union Army hospital on the Hord farm near the Nashville Pike. Now she stood like a small, stubborn rock in the foyer of Elmwood, the main house, a steady flow of blue-clad soldiers, orderlies, physicians, and nurses – the latter carrying bandages and basins, their stained aprons covering somber day dresses – streaming around her. “I can do this.” Julia steadied herself. “I must do this!” Although she was barely seventeen, she knew boys younger than herself were fighting and dying to preserve the Union. So, squaring her shoulders, she stepped in front of a young officer before he could hurry past her. The harried soldier came to a startled halt, nearly colliding with the slight girl who’d planted herself directly in his path. Although her round, pretty face was pale with fatigue and her navy blue travelling costume was rumpled, she met his eyes with steady resolution. He stammered a bit, trying to recover his wits. Thanking him, Julia turned and hurried toward the broad staircase. It took her more than an hour to make her way through the warren of upstairs rooms and hallways crowded with cots, chairs, and trays. Fighting tears, she stopped often to offer a gentle word to the maimed and bandaged men – some of them scarcely more than boys – who called out to her in their pain and loneliness. Some pleaded, “Begging your pardon, Miss, could I trouble you for a minute…?” Others, their frail tethers to life fraying, called her “Sissy,” or “Dearest,” or even “Mama.” Over and over, Julia felt her heart squeeze with pain. As at last she made her way into a bedroom at the end of the hall, a pair of orderlies quickly approached. They bore a moaning youth on a litter, his discolored arm wrapped in seeping, reeking bandages. As Julia shrank back against the wall to make room for them to pass, she heard a medical officer wearily calling after them. The doctor stepped away from a cot where a young man lay on a bloodstained sheet. As he opened his eyes, Julia gasped, her hand flying to her mouth to mute her cry. Julia took his trembling hand, bent to kiss him. His skin was hot and dry, his gray-green eyes cloudy and glazed. She knelt beside his cot, gently stroked his tangled hair from his forehead. Charlie stared at her. Then, incredibly, his eyes cleared a bit and he managed a rusty sound that might have been a chuckle. Then, against his will, his eyes burned with unshed tears. Julia glanced at the sodden bandages wrapped around his leg. She lifted his hand, pressed it to her lips. This time, Charles’ surprised chuckle was unmistakable. Charles froze, shot a desperate glance to Julia. She squeezed his hand, took a deep breath, got to her feet, faced the doctor. She barely came to his shoulder. 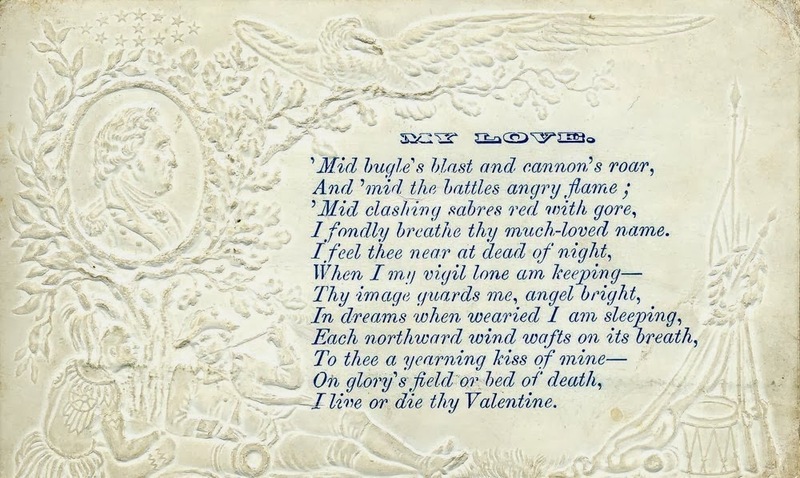 The poem at the beginning of this story is from a Civil War-era Valentine, sent by Joseph Forrest of the 8th Volunteer Illinois Infantry. It’s in the collection of the Kansas Museum of History and the Kansas Historical Society. Elmwood, the Hord family Greek Revival home near Murfreesboro, still exists. It is privately owned. 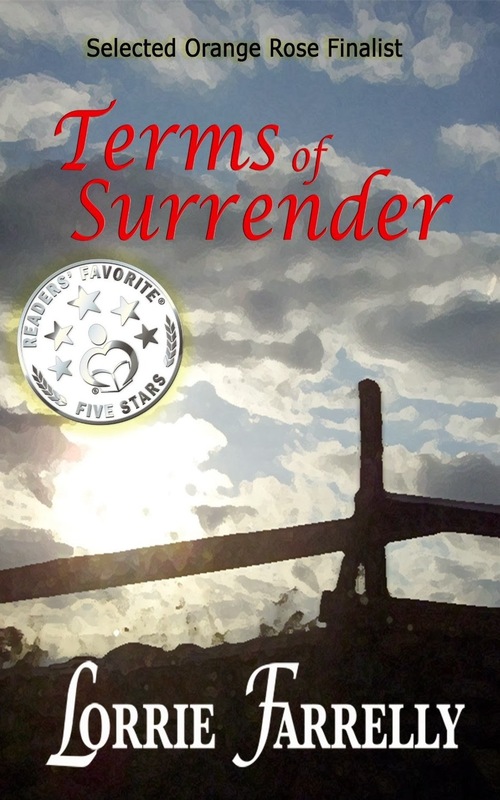 If you enjoyed this story, read more about Charlie and Julia in TERMS OF SURRENDER, a Western Historical Romance by Lorrie Farrelly. Available in ebook, paperback, and audiobook from Amazon, Barnes&Noble, iTunes, and Audible.com. Thank you for the lovely story Lorrie! That was a lovely story Lorrie. What a touching story! Thank you for sharing it with us, Lorrie.